An article published in the journal “Nature Geoscience” describes a research into the possibilities that the salt water beneath the surface of Mars contains oxygen. A team of researchers created a series of simulations based on the possible conditions existing in those environments, concluding that there can be oxygen in the case of exchanges with the atmosphere. This means that it’s possible that in the underground lake containing very salty liquid water of which the discovery was announced in July 2018 there’s some possibility that life forms exist that use oxygen in their metabolism. The publication in the journal “Science” of the discovery of a lake of liquid water below the surface at Mars south pole revamped some hypotheses on the presence of life forms on the planet. They’d be organisms of the type called extremophile, which can live in extreme conditions since the temperature in that lake is very low and the water is liquid only thanks to the presence of a considerable amount of salts, a feature that would increase problems for any living organism. A further problem is the presence of oxygen, which is very scarce in Mars atmosphere, present in traces generated by sunlight breaking the molecular bonds of a small percentage of carbon dioxide molecules. The consequence is that the various hypotheses concerning Martian life forms were based on the possibility that their metabolism was of an anaerobic type, like some microorganisms existing on Earth. However, according to some researchers coordinated by Caltech (California Institute of Technology) and JPL (Jet Propulsion Laboratory) that water could contain oxygen. The problem includes a series of environmental variables that take into account existing conditions in the recently discovered saltwater lake but also the climate changes occurring on Mars over time. The inclination of the planet’s axis varies a lot in the long run and this means that there are significant regional climate changes. This allowed the researchers to infer which regions of the planet can best support oxygen solubility today and in the recent past. As for the salt lake, the colder the water the more oxygen it can dissolve, but the more salt it contains the less oxygen it can retain. Basically, there are two conflicting processes in the lake and the authors of the research created a model to test a series of possible conditions. The result is that the lake could contain enough oxygen to support aerobic bacteria or even simple multicellular life forms such as sponges. A key factor is that the lake is close enough to the surface to allow an exchange of gas with the atmosphere. That underground lake is the main example of a reserve of liquid water on Mars but in the last few years a number researches showed other possibilities. 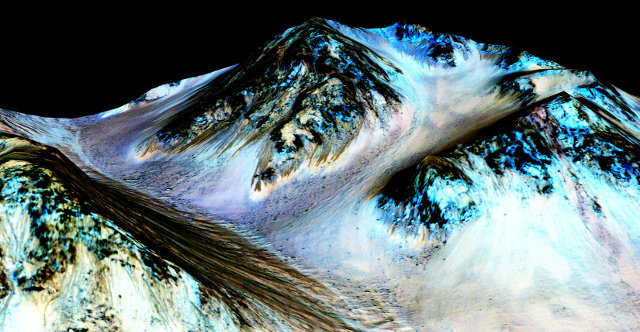 In September 2015 NASA announced the existence of liquid water flows on Mars: afterwards that claim was disputed but other announcements of the kind arrived. Flows on the surface could absorb oxygen more easily than an underground lake. This research is raising excitement, but when it comes to life forms on Mars there are only hypotheses. The presence of oxygen would increase the probability that they exist but they should still be far more extreme organisms than those existing on Earth. Conditions were much more favorable to life when Mars was young and much more similar to the Earth: if they were born, some organisms could have adapted to much harsher conditions in the period when the climate on the red planet changed dramatically. It’s a hypothesis but certainly the studies will continue, hoping to be able to obtain information on the spot to verify it.